I visited the University of Torino in 2007 to speak with the team developing UAVs for the World Food Program. Since then, I’ve bought and tested two small UAVs of my own so I can use this new technology to capture aerial imagery during disasters; like the footage below from the Philippines. UAVs, or drones, have a very strong military connotation for many of us. But so did space satellites before Google Earth brought satellite imagery into our homes and changed our perceptions of said technology. So it stands to reason that UAVs and aerial imagery will follow suit. This explains why I’m a proponent of the Drone Social Innovation Award, which seeks to promote the use of civilian drone technology for the benefit of humanity. I’m on the panel of judges for this award, which is why I reached out to DanOffice IT, a Swiss-based company that deployed two drones in response to Typhoon Yolanda in the Philippines. The drones in question are Huginn X1’s, which have a flight time of 25 minutes with a range of 2 kilometers and maximum altitude of 150 meters. I recently spoke with one of the Huginn pilots who was in Tacloban. He flew the drone to survey shelter damage, identify blocked roads and search for bodies in the debris (using thermal imaging cameras mounted on the drone for the latter). The imagery captured also helped to identify appropriate locations to set up camp. When I asked the pilot whether he was surprised by anything during the operation, he noted that road-clearance support was not a use-case he had expected. I’ll be meeting with him in Switzerland in the next few weeks to test-fly a Huginn and explore possible partnerships. This platform was used in Haiti with the above drones. 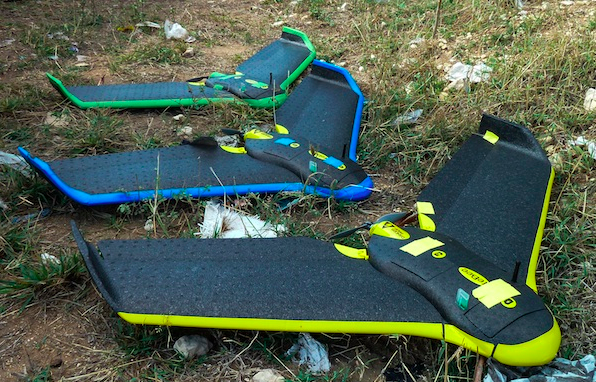 The International Organization for Migration (IOM) partnered with Drone Adventures to map over 40 square kilometers of dense urban territory including several shantytowns in Port-au-Prince, which was “used to count the number of tents and organize a ‘door-to-door’ census of the population, the first step in identifying aid requirements and organizing more permanent infrastructure.” This approach could also be applied to IDP and refugee camps in the immediate aftermath of a sudden-onset disaster. All the data generated by Drone Adventures was made freely available through OpenStreetMap. If you’re interested in giving “drones for social good” a try, I recommend looking at the DJI Phantom and the AR.Drone Parrot. These are priced between $300- $600, which beats the $50,000 price tag of the Huginn X1. This entry was posted in Crisis Mapping, Drones/UAVs, Humanitarian Technologies, Satellite Imagery and tagged Aerial, Disaster, drone, Imagery, Response, UAV. Bookmark the permalink. The use of drone aircraft for damage assessment has been one of the avenues explored by the Norman, Oklahoma chapter of the Red Cross, and a drone was used to a limited extent following the Moore tornado in May. One of the DA Managers there is a big proponent of using new technologies and techniques for assessment, including drones. We’d love to hear your comments / suggestions! Reblogged this on Phd in Strategic Management.